The workouts will be things like drop down and give us 10 push-ups or burpees or even get out and run (or walk) a mile! Each day, we’ll all share what we’re doing and how we’re doing it on our social channels and help each other stay accountable, motivated and on top of our goals. Want to sign up? Use this link: http://bit.ly/1yCAQLl. 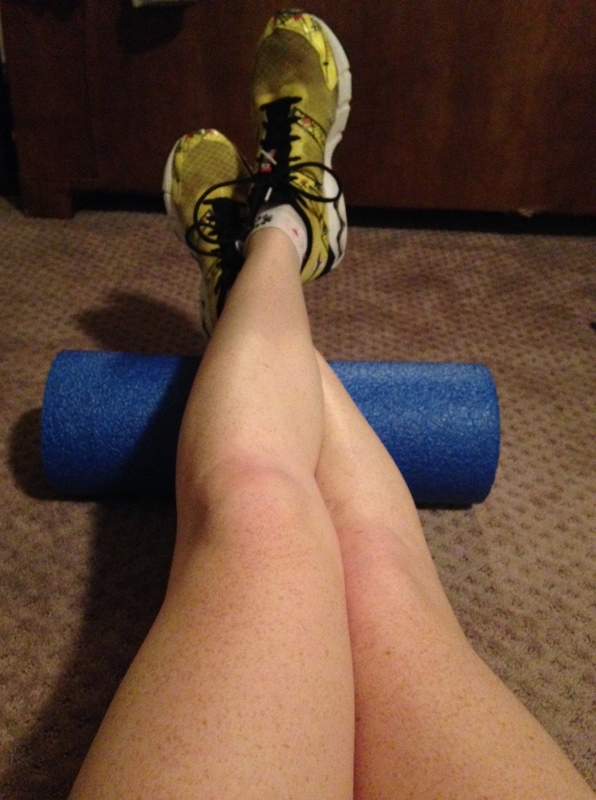 Now, let’s talk about week 2 of marathon training. Between marathon training cycles, I tend to forget, or maybe just look at through rose-colored glasses, how time-consuming training is. This cycle seems especially so, since I’m going back to a Pete Pftitzinger training plan after using McMillan plans for the last two races. Both plans have about the same overall mileage, but Pftiz has longer-at-once mid-week runs — an 11-miler one day and a 5-miler the next, for instance, instead of two 8-milers like McMillan’s. I’m hoping that the mid-week longer runs will make me stronger and faster so I can finally get over that 3:13 hump. So I’m willing to put in the mileage, even if that means seeing numbers like this on a treadmill on weeknight. AM: Longer runs also mean two-a-day workouts when I strength train. I’m trying to do upper and lower body on different days, when possible, so I can spend a little more time on each. Monday was upper body and core. 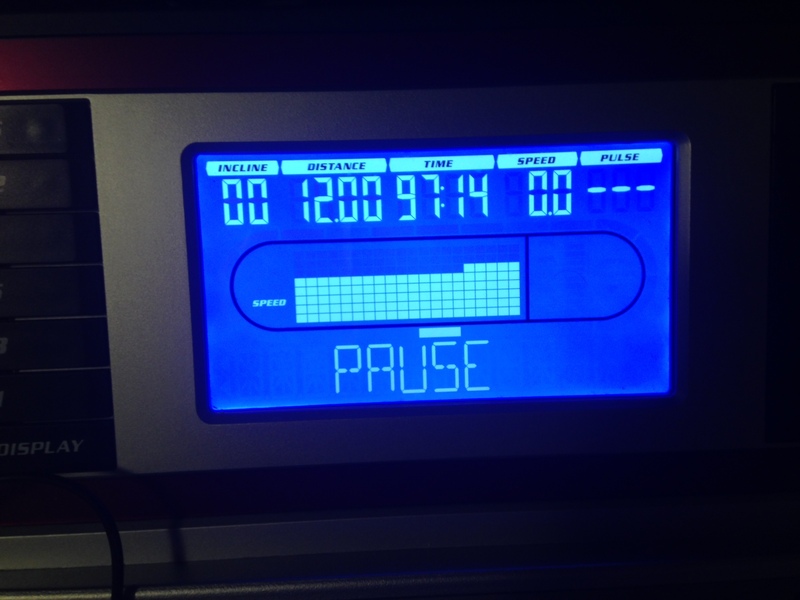 PM: 8 miles with 10 strides… or at least as close as I could come to running strides on a treadmill. They’re so short that it’s tough to do them inside. AM: 30 minutes lower-body strength training. PM: 12-mile easy run. I was pretty disappointed to see that I can’t watch The Bachelor on Hulu yet for free. Looks like I’ll be a week behind all season, so no spoilers! AM: 5-mile recovery run followed by some stretching and foam rolling, I’m really bad about doing those two things, so one of my goals this cycle is to diligently do them. Only one workout today, as I had an evening full of meetings. AM: 9 miles easy. J and I both had meetings/stuff that had to be done after school, and I wasn’t sure how long they would take, so I wanted to make sure the run got done. PM: Quick upper-body and core strength workout. 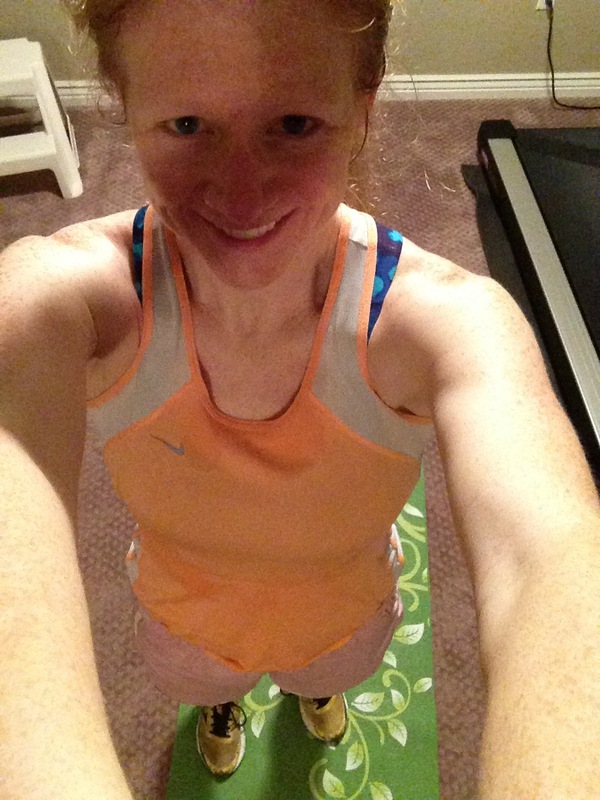 AM: 5-mile recovery run, some core work, and a bit of stretching. And then I took a selfie, because that’s what bloggers do. Working out at home is the best, because who has time for clothes that match? J had a meeting in Denver (read: free hotel room), so I went up and stayed with him Friday night. Saturday morning, I headed to the Cherry Creek Trail for what was supposed to be 16 miles with 8 at goal pace. 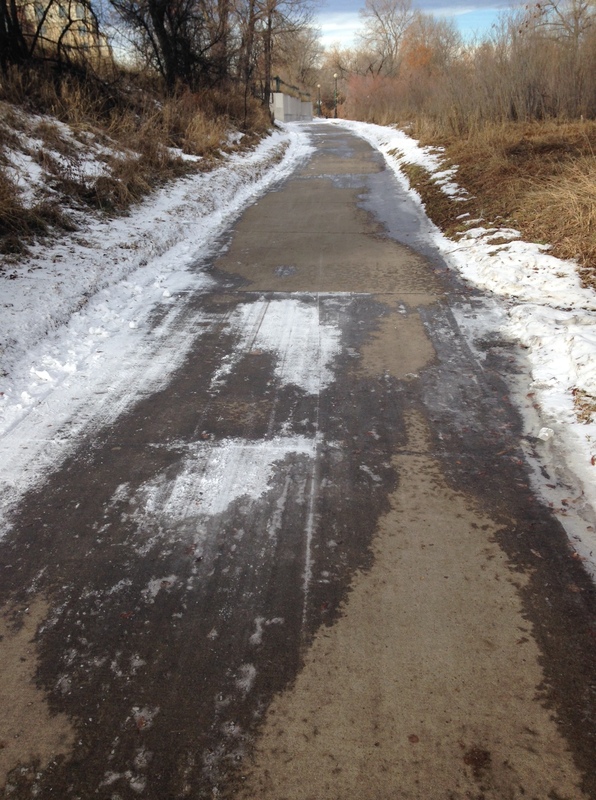 The first couple of miles were pretty clear, but then the patchy ice became more ice than concrete. Instead of goal pace, I stuck with “stay-upright” pace. It was a beautiful morning, though, and I love running in Denver, so overall, I’m not disappointed. I’m a little sore today, even though I didn’t go fast. I think it’s from stabilizing myself on the ice. Afterward, I met up with my two college roommates for pedicures and brunch, so Saturday was pretty super overall. Rest; just 30 minutes of yoga. J agreed to try joining me for my Sunday yoga sessions. I’m pretty excited… even though he’s WAY more flexible than I am and will show me up. Are you joining the #NoExcuses challenge? DO IT. What’s your favorite city to run/exercise in? Previous Post7 Healthy Breakfasts to Start Your Day RightNext PostWhy Do You Run So Much? “Stay upright pace” <— hahaha! That was me this week! I ran on the Cherry Creek Trail while we were in Denver this summer. 🙂 How far from Denver are you? About 1.5 hours. What did you think of the Cherry Creek Trail? That trail covered in ice looks brutal. That’s the worst because you just can’t gauge how slippery each step is going to be. I’m guessing you probably did a lot of hopping around. The path looks beautiful though. I am the same way when my husband has to travel for work – it’s like a free mini vacation for me and I don’t mind all of the downtime to myself. You did 55-miles in WEEK TWO!?? What is your peak mileage this training cycle? I should peak at 70. I hope it’s worth it! Rock n Roll Seattle was my first marathon, and my first post-marathon run was up in the Dungeness Bay area. I loved it there and wished I was ready to run more.